Diamond blades are popularly used for cutting asphalt and performing other construction tasks. If you are new to cutting asphalt or diamond blades, there is a lot of information pertaining to beginners that you should know. Here are some tips to get you started. It may seem like common knowledge to make sure you use the right blade when cutting asphalt, but if you are new to the process or the use of diamond blades, you may not realize there are different types of diamond blades available. In fact, there are a number of different types of diamond blades, all made to cut different kinds of materials. For example, if your blade is not made to cut asphalt, the asphalt will break the blade down at a quicker rate. For this reason, you should check the chart on the back of the diamond blade package to determine if it is rated for asphalt or another material like glass or porcelain. To maintain your diamond blade and extend its life, check the arbor shaft before you start cutting. If you notice that it moves or wobbles in any way, then it will be rough on your diamond blade. The movement will cause uneven breakdown of the blade, as well as possible warping if the movement is too much. You can check the arbor shaft by moving it back and forth and seeing if you notice any movement that should not be there. If the table shaft is wobbling or moving, you should repair and maintain the shaft prior to using the diamond blade. New blades should be eased into cutting. By easing the blade into use, you are not opening it up to extreme stress and pressure on the first cut. Therefore, you are helping to maintain the strength of the blade over time. You may want to start the first cut with something softer than asphalt or concrete. Doing so will ease your blade into the being used. It will also let you know right away if there are any issues with your blade. With that in mind, you should also try to use a wet or damp blade the first time, as well. This will cut down on abrasions that can damage a new blade. The one thing that many people look over in their cutting checklist is the surface itself. There are several things you should check before getting started. One of the main checks should be the level of the surface. You will want a clean, flat surface for cutting. 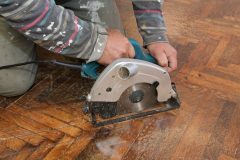 If the surface is not flat or even, you could end up with uneven cuts or with broken and chipped blades due to the change of height in the surface. If the area is not cleaned, then the debris can also cause issues with the blade. If the debris is hard enough, such as a piece of concrete, it could cause major damage to the blade, resulting in the need for repairs or replacement. Keep in mind that the slightest difference in surface texture or elevation will cause issues with your arbor shaft, throwing off the balance and damaging the blade. Simply sweeping the area before you start cutting can help reduce surface issues. By keeping these tips in mind, you will be able to start safely using diamond blades. This advice will also help maintain and possibly extend the life of your diamond blades. If you need help maintaining your diamond blades, or you would like to purchase more blades for your business, contact Crozier Diamond Tools today.